Oswald was killed in action on 24th May 1918. Oswald was born in 1879 the fourth child of Thomas Edwards and Rachel Davies who were married in Chester in 1872. In 1881 they were living in Cymmau. Thomas Edwards was 29, a collier, Rachel was 28, Amy was 7, Sabina was 5, Valentine was 4, Osweld was 2 and Lily S. was 2 months. By 1891 they had moved to Lower Street, Caergwrle, Thomas Edwards was 39, a coal miner, Rachel was 37, Amy was 17, Sabina was 14, Oswell was 12, Valentine was 14, Lily was 10, Zyrtha was 8, Mary was 6 and Edward J. was 4. In 1895 Oswald’s father Thomas has had a change of profession. He is listed in Slater’s Directory of North & Mid Wales, 1895 as a shopkeeper. In 1901 they have also had a change of address. The family are now living at Castle Dining Rooms, Castle Street, Caergwrle. Thomas Edwards was 49, a grocer, Rachel was 48, Amy was 27, Oswell was 22, a brewer and labourer, Lillie S. was 20, Zilpah Zyrtha was 17, Mary E. was 15, Edward J. was 13 and William J. was 8. On 19th October 1905 Oswald married Susannah Elizabeth Woodward the daughter of Thomas and Elizabeth Woodward who lived at Talwrn Smithy, Cefn-y-Bedd. They had two daughters, Sylvia born in 1907 and Rachel born in 1911. Oswald’s mother Rachel died in 1907. Oswald’s Military records have survived and can be viewed at Find My Past (findmypast.co.uk) or Ancestry (ancestry.co.uk). They tell us that Oswald enlisted at Wrexham and joined the Royal Garrison Artillery on 1st November 1915 when he was 37 years and 8 months old. His profession was a barman and he gives his address as The Castle Dining Rooms, Caergwrle. He was 5′ 8 1/4″ tall with a 35″ chest and he weighed 148lbs. He had a mole on the back of his right thigh. He gives his wife’s name, Susannah Elizabeth Edwards, and her address as Talwrn Smithy, Caergwrle – her parents’ address. From the 1911 census, Talwrn Smithy only had 2 rooms, so it must have been quite a squash when Susannah and her two daughters moved in. Oswald’s Regiment proceeded overseas at the beginning of 1916. On 9th March he was posted to 17X Trench Battery. On 16th August of the same year he was granted “Leave to U.K. with Ration Allowance from 16th August to 26th August 1916”. On 13th March 1918 he was posted to V 5th Heavy Trench Mortar Battery on re-organisation, and was killed in action on 24th May 1918. Following his death Susannah was required to give details of next of kin. Full blood brother was Willie Edwards aged 26, Castle Dining Rooms, and full blood sister, Amy Edwards aged 46, Castle Dining Rooms. Niece was Amy Atkins aged 17, Castle Dining Rooms, and an aunt was named as Mrs E. Braithwaite aged 78, High Street, Caergwrle. “In a letter to his wife, the Company Sergeant pays a special tribute to the deceased and reports that over his grave they have placed a wreath, which was collected from the Battery. The Officer Commanding this Company has also written a very sympathetic letter, saying that the Officers of the Battery sympathise with the deceased’s wife and family in their great loss and that Gunner Edwards, who was always cheerful and brave, was an excellent example of what a soldier should be”. Another Caergwrle hero has fallen in action, namely Gunner Oswald Edwards, son of Mr T. Edwards of the Castle Dining Rooms. Oswald’s body was later exhumed and buried at Mesnil Communal Cemetery Extension. Susannah was awarded a pension for herself and her two children of 25 shillings and 5 pence a week. 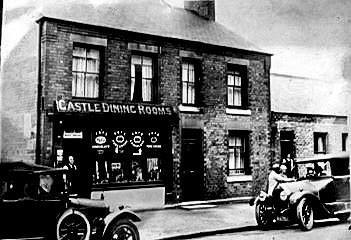 Castle Dining Rooms, Castle Street, Caergwrle, where so many of the family lived and worked. There is an index card for Oswald Edwards in the Flintshire Roll of Honour at the County Record Office in Hawarden which confirms the regimental details above.